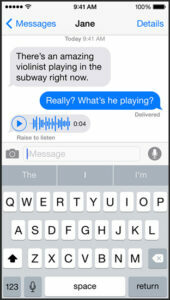 Messages in iOS 8 makes it easy to capture any sound, your voice,or song , & make it part of the conversation. 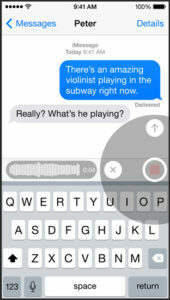 Simply touch & hold the new microphone button to record your message. Then swipe to send it. Tap to Talk, then send instantly. 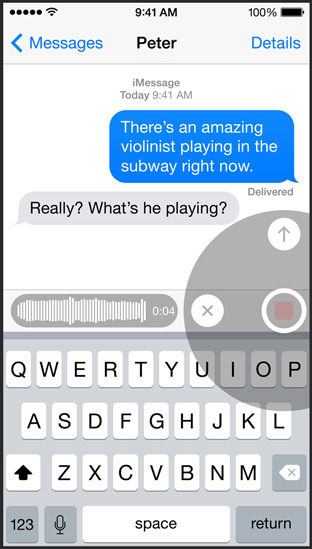 Touch and hold with your thumb to record your message, then swipe up to send it. Lift to your ear to listen. To hear a message, simply hold iPhone to your ear and listen like it’s a phone call. Or just tap the Play button.